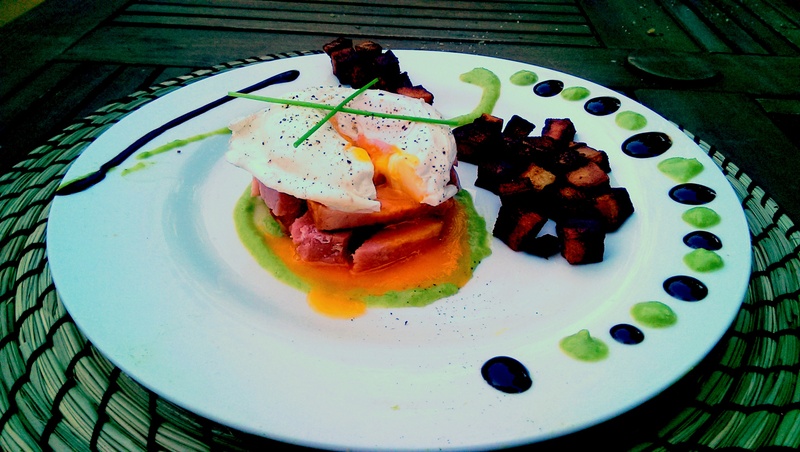 Ham, Egg and Chips is a staple of British pub food and simple home cooking in Britain. Quick, easy and satisfying…so I thought how can I make this needlessly complicated and overthought? Fact remains that this dish was absolutely delicious, very filling and visually gorgeous. Definitely a fun one for when you’re entertaining dinner guests. Preheat your oven to 190C. 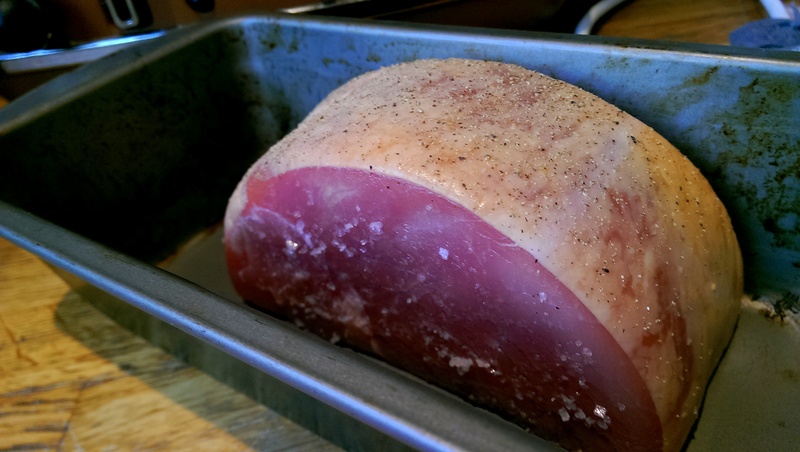 Rub your gammon joint with seasoning and place in a roasting tin. 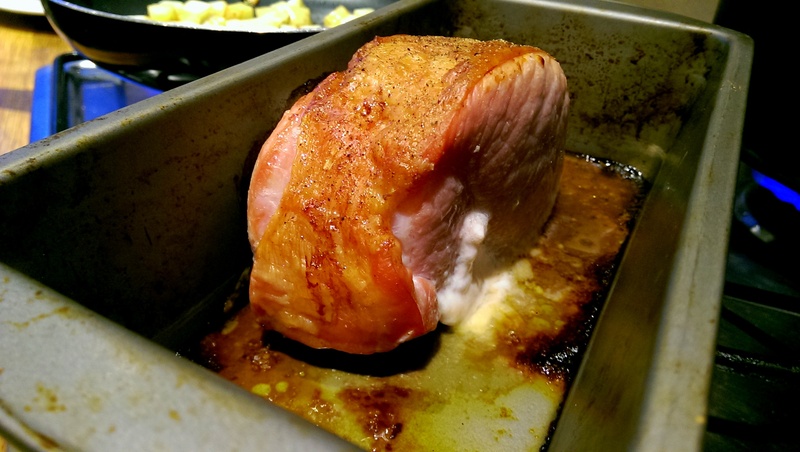 Roast for roughly 35 minutes per 500g plus 30 minutes. 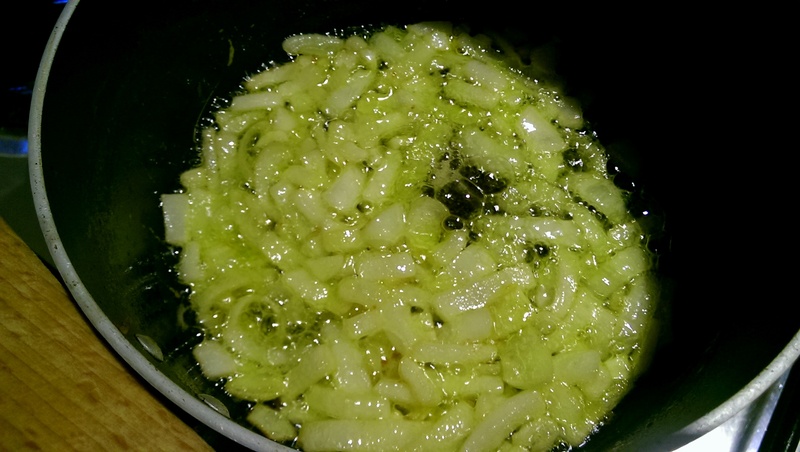 While it’s cooking, chop your onions and fry in butter for a few minutes until beginning to turn golden. Adding salt at this stage will help. 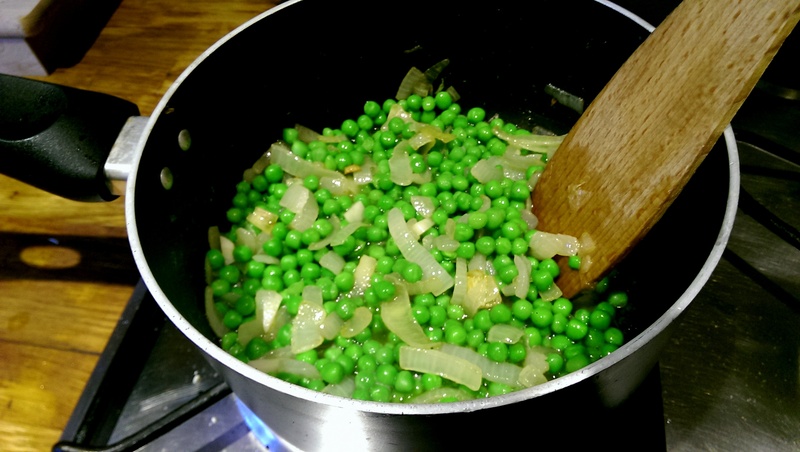 Add the peas and stir for a few minutes, not allowing them to brown. 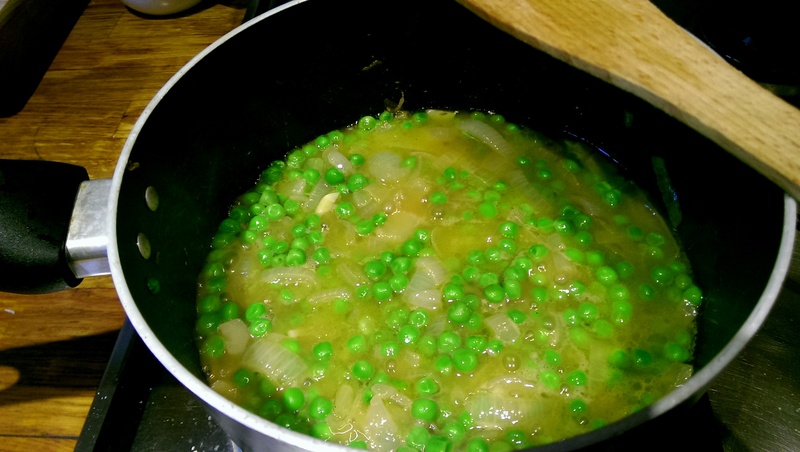 Add a few splashes of stock and simmer until the peas are nice and soft, then blend thoroughly. It’s best to be conservative with the liquid at first and then gradually add to make the mixture runny enough. 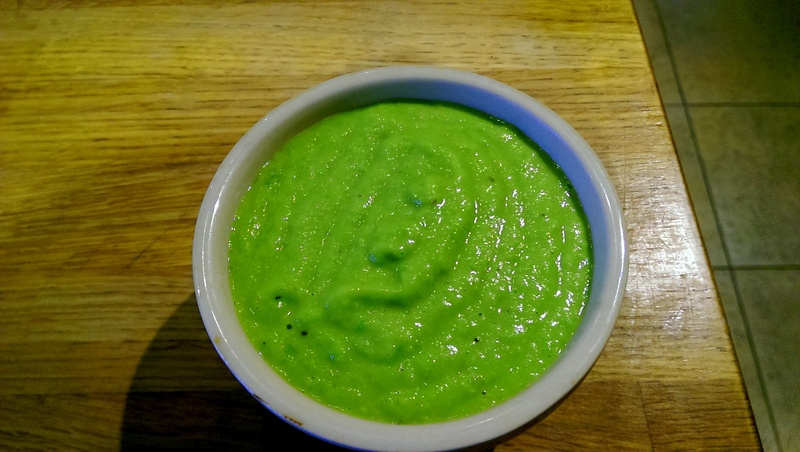 I like a very smooth purée but you might prefer yours chunkier and thicker – closer to mushy peas. Keep the puréed peas warm while you prepare the rest of the dish. 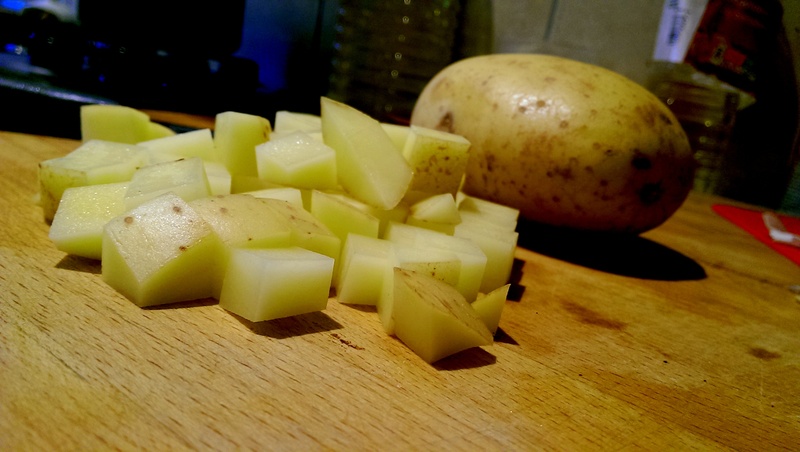 Dice the potatoes and soak in warm water for a few minutes, squeezing and mixing to get out as much starch as possible. 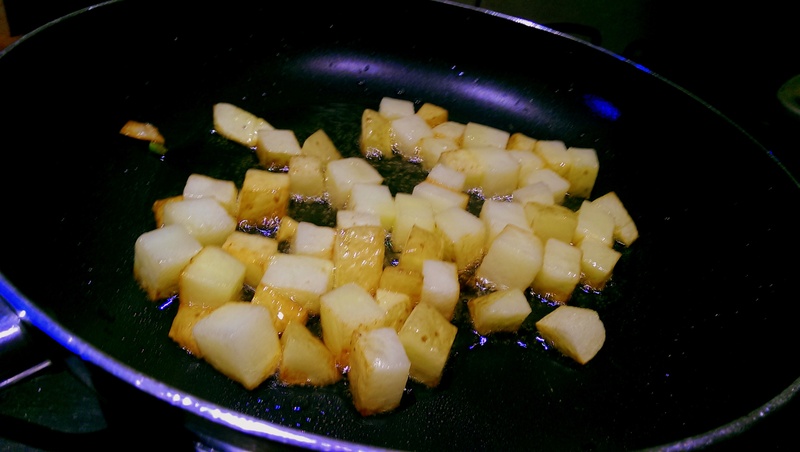 Melt some butter in a pan and fry the potatoes. If you’re lucky like me, your gammon will be ready around the same time, so you can add some of those delicious meat juices to the mix. Fry until crispy on the outside and soft on the inside. Poach the egg. For those who have never done this, simply bring a pan of water to the boil and add a few splashes of vinegar (this helps prevent the egg separating). Crack the egg into a small dish, stir the water so you have a slight vortex going and add the egg gently to the middle. Allow it to cook for a minute or two before removing with a slotted spoon. Slice the Gammon and serve. Again, as this is a pretentious dish, you can serve it as painfully overdone as possible. I opted for an unnecessary swirl of purée along with some balsamic glaze, put the ham inside the swirl and topped with the egg, split up the chips for no good reason and topped the egg with two chives. 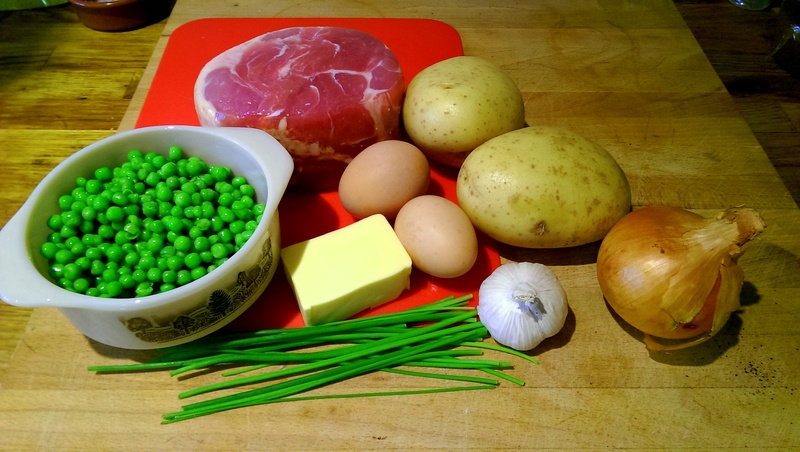 Posted in Guesscipes, Mains, Pork, SaucesTagged bacon, chips, cooking, decospoon, egg, food, gammon, gourmet, guesscipe, ham, peas, poached, puree, recipeBookmark the permalink.